Raymond Barbour, Lusaka, Zambia #1 R. Barbour: "This Diamond Ring shot was taken in Lusaka using a Pentax MZ-7 with a sigma 70-300mm zoom lens with a 2x double on Fuji iso 400. 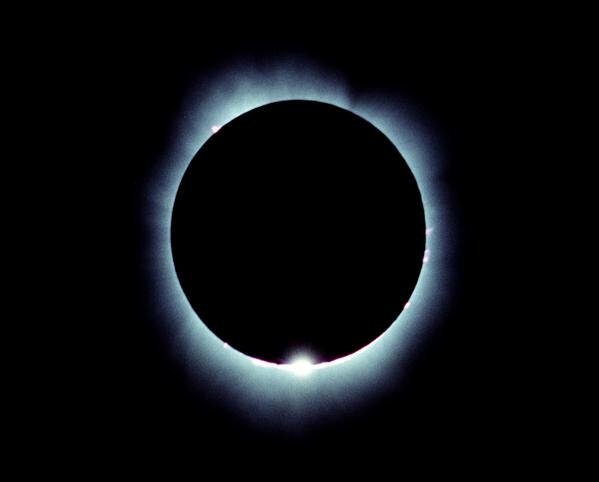 This was after totality and the image was rotated through 180 degrees." Listen! 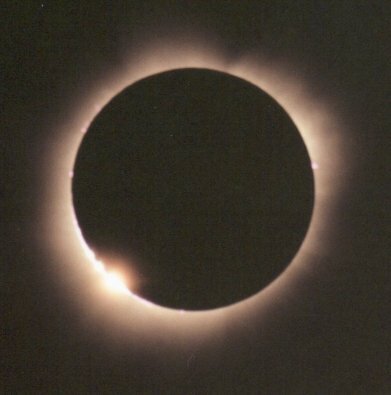 Rudolf Reiser, Lusaka, Zambia audio files: MP3 or RealPlayer R. Reiser in Lusaka recorded this MP3 audio file containing the cheers of about 1000 eclipse enthusiasts during the last 30 seconds of totality. Listen! Mitzi Adams, Lusaka, Zambia audio files: MP3 or RealPlayer NASA astronomer Mitzi Adams, along with students and scientists from Williams College, observed the eclipse from Lusaka. 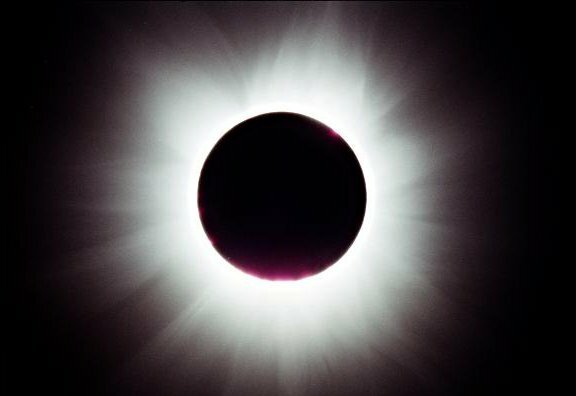 A microphone recorded their cries of delight as shadow bands swept by their camp moments before totality. Mitzi Adams, Lusaka, Zambia #1 The Moon's shadow is cool, literally! 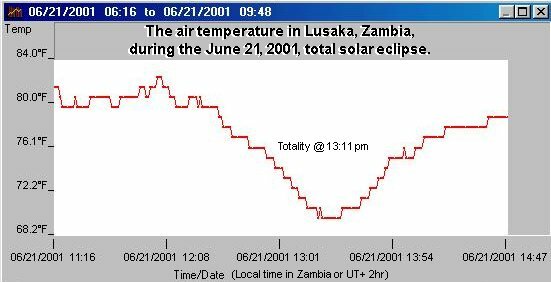 When it swept by Lusaka, Zambia, on June 21st the air temperature dropped nearly 5 degrees F. Click here to view air temperature measurements by NASA astronomer Mitzi Adams. 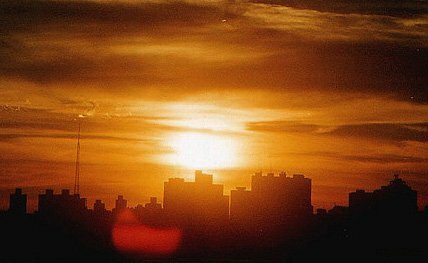 Raquel Yumi Shida, São Paulo, Brazil #1 R. Y. Shida captured this photo of the partially eclipsed Sun near dawn from Brazil. 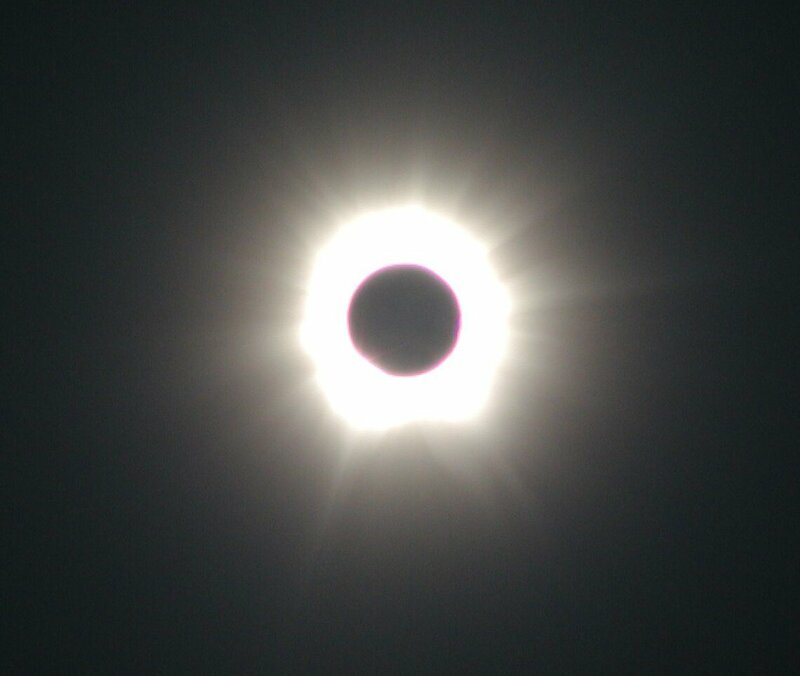 The cloudy Sun doesn't appear eclipsed, but the lens reflection reveals a fat crescent! Paul Venter, Johannesburg, South Africa #1 P. Venter: "These were crescent-shaped spots of sunlight under trees during the height of the eclipse as seen from Johannesburg." SOHO at the LI point in space & Jay Pasachoff in Lusaka, Zambia #1 At the center of this montage is an extreme ultraviolet image of the Sun captured by SOHO. 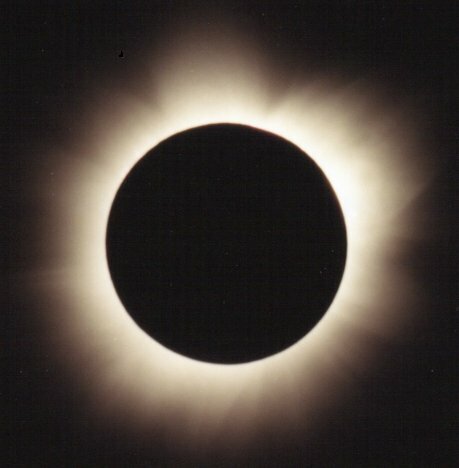 The innermost corona (grey) was photographed by Jay Pasachoff in Zambia. 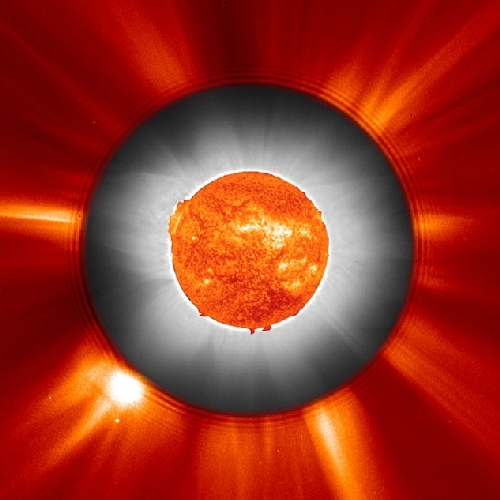 The outer corona (red) was imaged by a SOHO coronagraph. All three images were captured at the same time. 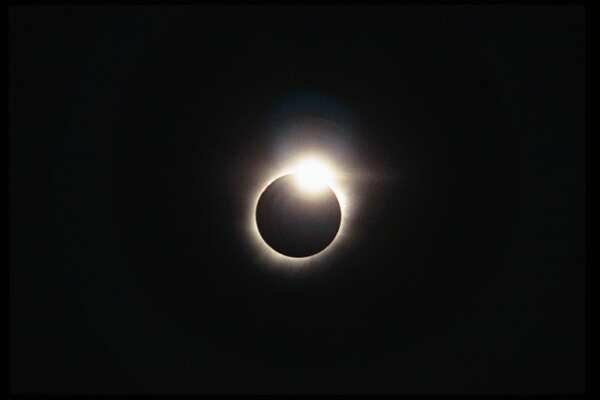 Faan Le Roux, Lusaka, Zambia #1, #2 Photo Details: F. Le Roux captured the diamond ring using a 500 mm mirror lens and totality using a Celestron 8 inch telescope. Both photos were recorded on 400 ASA film. J.A. 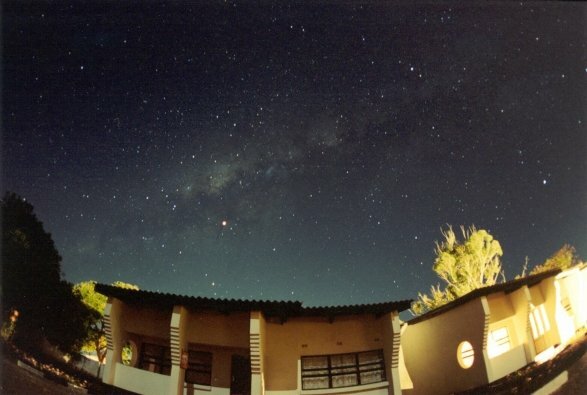 Pereira, Olinda, Brazil #1 Early Thursday when the Moon's shadow was first touching down on Earth, J.A. 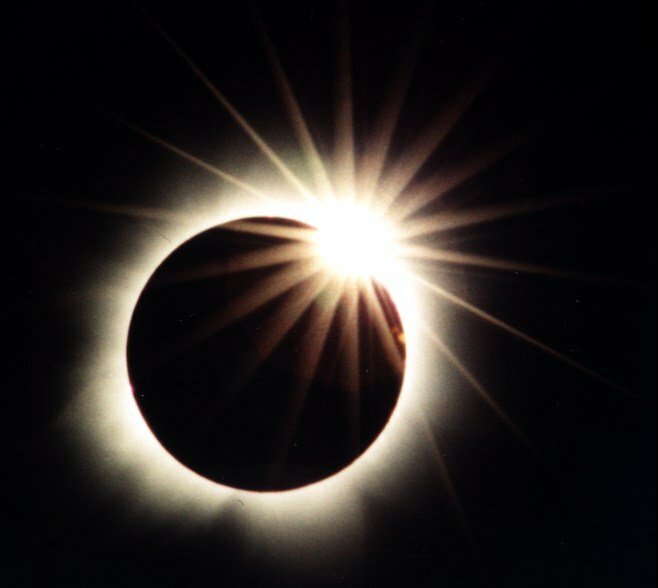 Pereira (Recife Astronomical Society) captured this photo of the partially eclipsed Sun projected onto the ceiling of his kitchen. 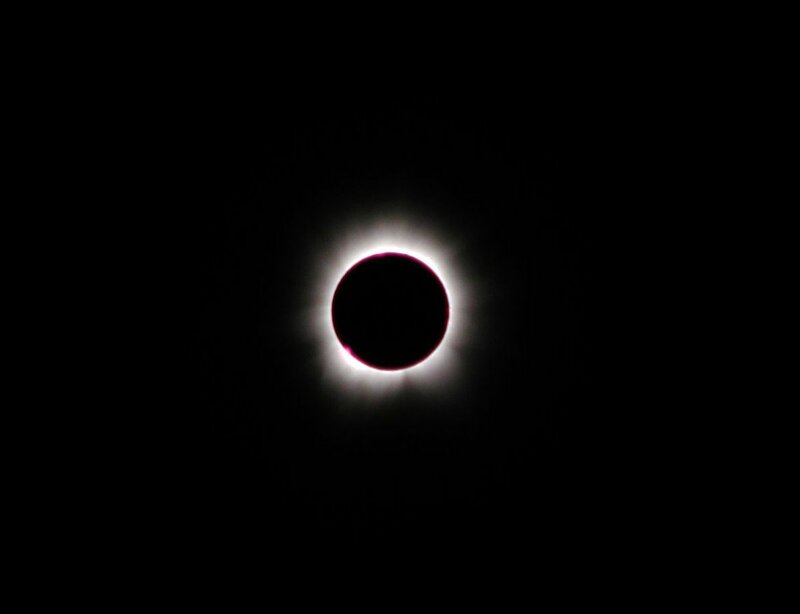 Tony Simon, Lusaka, Zambia #1, #2, #3, #4 T. Simon captured these images of 2nd contact, 3rd contact, and totality from Lusaka. Photo details: 500mm lens f/8 and a 1.4 telecon, giving 700mm f/11. Film: fugi Superia RealA100. See also this image of Mars and the Milky Way captured the night before. 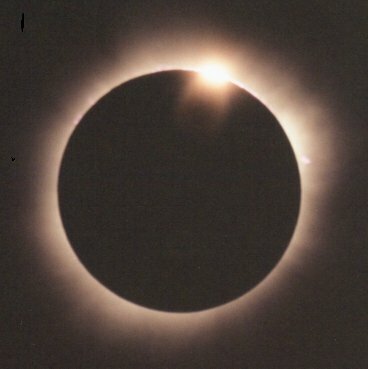 Rudolf Reiser, Lusaka, Zambia #1, #2 R. Reiser captured these photos of the Sun's corona and the "diamond ring effect" from Lusaka, Zambia. He also recorded this MP3 audio file containing the cheers of about 1000 eclipse enthusiasts during the last 30 seconds of totality. 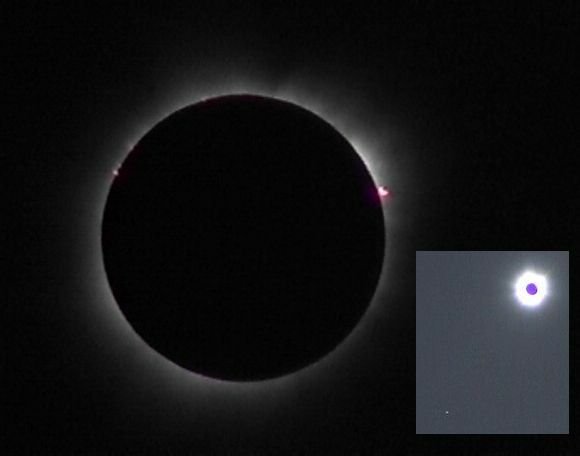 Olivier Staiger, Lusaka, Zambia #1, more The main image shows the Sun's inner corona with pinkish prominences poking out around the solar limb. 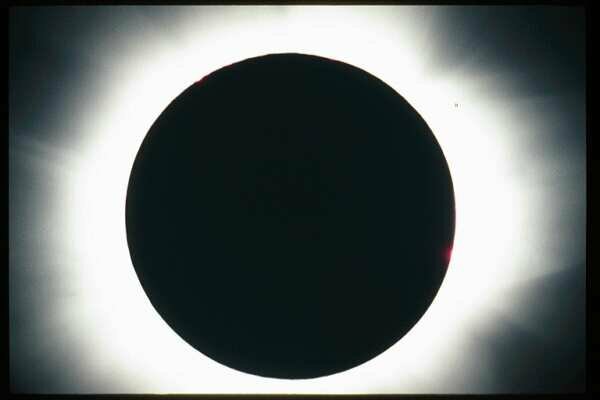 The inset reveals the spiky outer corona along with the bright planet Jupiter shining at the lower left. 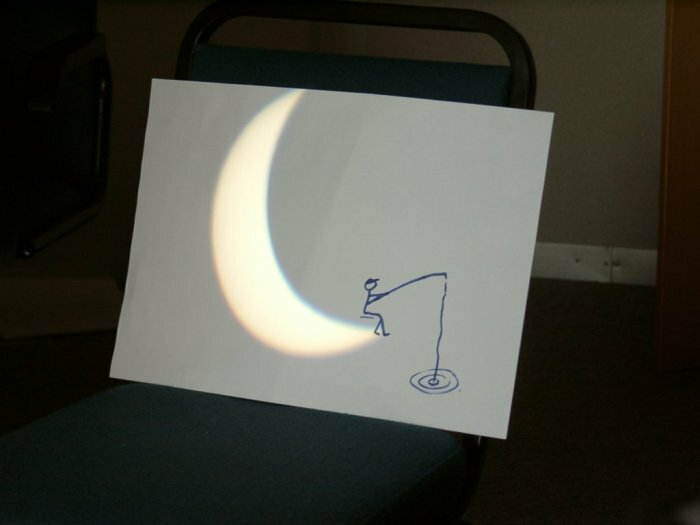 Christo Keyser, Pretoria, South Africa #1 Marius Vogel, Justin Joubert (the group's artist) and Christo Keyser captured this amusing photo of the partially eclipsed Sun in Pretoria, projected onto a white piece of paper. Says Keyser: "Most of South Africa took a midday break to watch."